Does your dog put on that sad face when you pack up your flip-flops, swimsuit and straw hat? Then don’t leave your dog behind. With a little forethought and planning, you can help your dog enjoy the water with you this summer. Here are a few things to consider before you head for the pool, beach or marina. Before you hit the beach, look up the city ordinances to make sure dogs are allowed. Many beaches have regulations about issues such as licensing, leash requirements and designated areas where dogs are allowed. Don’t get your dog in deep water. Water-loving canines may have inspired the “dog paddle” swimming stroke, but not all dogs take to the water naturally. Brachycephalic breeds, or those with short, flat muzzles such as pugs, bulldogs and Pekingese, are more likely to sink than swim. The combination of their compromised respiratory systems, short legs and hefty chests make them better off staying on the beach. And while some dog breeds may leap off docks like gazelles, it’s never a good idea to throw dogs into deep water to jump-start their swimming instinct. Instead, it’s better to start in shallow water and introduce them to swimming gradually. If your dog is swimming in a pool or from a boat, make sure to show how to use steps or ladders to climb out. Even the best canine swimmers can be no match for undertows, fast-moving currents, motorboat wakes and simple exhaustion. 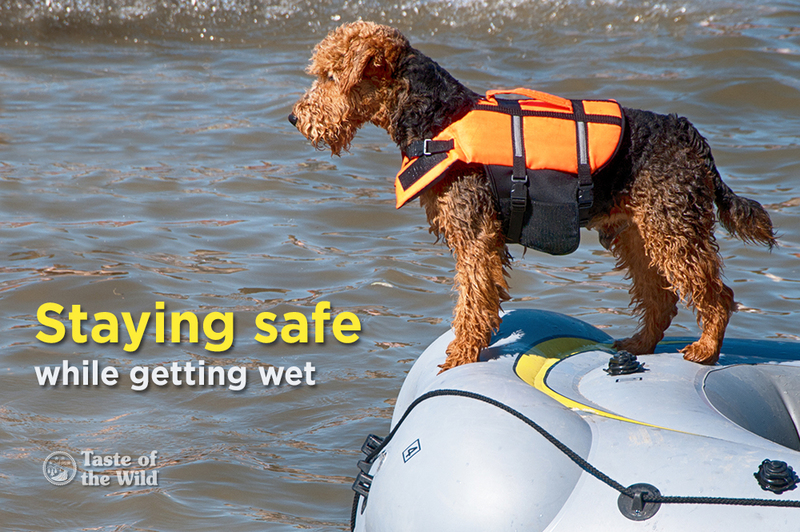 As with a person, the right life vest could help save your dog’s life. Look for a snug-fitting but comfortable life vest that gives your dog’s limbs good range of motion. The vest should have excellent buoyancy and a sturdy handle or two on top to help you lift your dog out of the water if needed. Of course, children of the furry kind should never be left unattended in any body of water. Before your dog rolls on dead fish, scope out the beach for potential dangers. It’s better to remove broken glass, abandoned fishing lures with sharp hooks and other trash that washes up on shore before your intrepid dog finds them. If your dog’s playing fetch or Frisbee on the beach, make sure he or she doesn’t accidentally swallow too much sand, which can lead to a gastrointestinal obstruction. Although it’s natural to swallow a little water while swimming, you don’t want your dog to lap up too much. Swimming pools, for example, can contain chlorine and other chemicals. And ingesting too much salt water can result in an electrolyte imbalance that can lead to dehydration, vomiting, diarrhea, seizures and worse. Bacteria and parasites enjoy swimming in lakes, rivers and ponds just as much as your dog does. Ingesting bacteria such as Escherichia coli or Giardia parasites can lead to gastrointestinal upset. Even more dangerous are Leptospira spp. bacteria, commonly found in stagnant water, which can cause liver and kidney failure. And drinking from lakes and ponds containing blue-green algae can be deadly. By bringing plenty of fresh water and a collapsible drinking bowl for your dog, you can eliminate your worry over these parasites. And make sure to rinse your dog off after swimming to help clean his or her coat. Since dogs can’t sweat like people do, it’s easy for them to overheat in the hot sun. Once again, brachycephalic breeds are at greater risk for heatstroke than other breeds and may prefer the air-conditioned comfort of your home. Signs of heatstroke can include panting, drooling, difficulty breathing, vomiting, diarrhea and seizures. This can be a serious medical emergency, so see a veterinarian immediately if your dog is showing these signs. If you’re out of town when such a medical emergency occurs, you can find an emergency veterinary hospital by checking VetLocator.com. Dogs with light-colored noses, short or white coats or those with relatively no hair at all can be vulnerable to sunburn and skin cancer. Ask your veterinarian to recommend a broad-spectrum sunscreen that’s safe for dogs. Lastly, don’t forget that hot sand can be uncomfortable on your dog’s paws. Make room for your dog under the shade of your beach umbrella so you can both relax and take in the summer sights.